NCSAM Week 4 – What’s your apptitude? You are here: Home / Barracuda / NCSAM Week 4 – What’s your apptitude? It's the 4th and last full week of National Cybersecurity Awareness Month, and the theme is Our Continuously Connected Lives: What’s Your “Apptitude”? How do you stay safe in a world where there is an app for everything? How do you protect your privacy when so many things are connected to you as an individual? That's the focus of this week. There are a number of basic steps you can take to protect yourself from identity theft and malicious attacks. • Use strong passwords: change your passwords immediately when you buy a new device, like a wifi camera, mobile phone, or a router. Use a password that will be difficult to guess, and do not use the same password on different programs or devices. Do not store passwords on the device. • Keep software up to date: Installing updates on a regular basis will ensure that you get the latest security patches for your firmware, operating systems, and applications. This is the best way to keep attackers from exploiting known vulnerabilities. • Know your applications: Be aware of the permissions that apps request when they install. Some will request access to your location, pictures, camera, and other personal information. Deny permission if you do not know what the app is doing. Delete apps that you do not use. • Protect your devices: Do not leave your smartphone, tablet, or laptop unguarded in a public place. Lock your devices when they are not in use. • Avoid public networks: Public wifi is great for browsing safe sites, but avoid this for sensitive activities like online shopping, banking, and anything else that requires passwords or other sensitive information. For more tips on how to stay safe online, visit the Stop.Think.Connect. Website. For some tips on how to protect yourself from ransomware, see our blog post here. 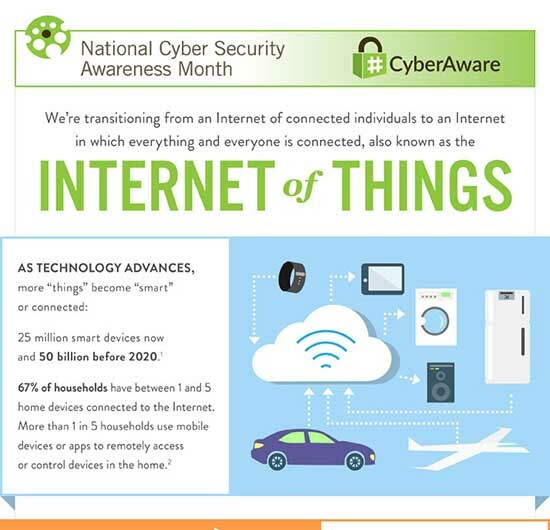 Click here to download the full-size pdf version of the infographic on how to stay safe in your continuously connected life.